Strangeness and Charms: SHOPPING LOVE: prom dresses. which girl doesn't dream of her perfect prom evening in a fabulous, flattering & fashionable dress everyone else will be envious about? i had been lucky to have two prom dresses during my school time. 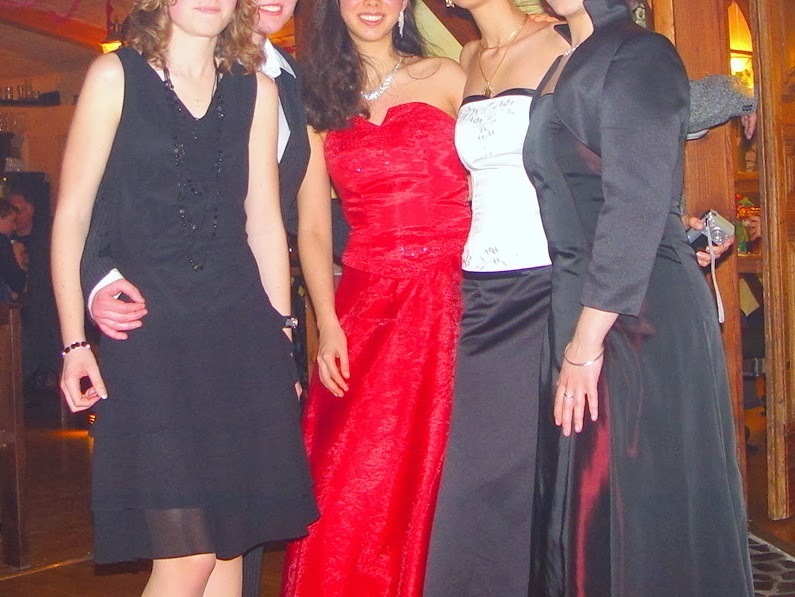 the first one was the graduation party for my fellow classmates who left school at the end of the 10th grade. the second one was the graduation party for all of us who mastered the A levels. both times i have betted on the red - and both times it was a comprehensive victory. nobody else seemed to be game enough to wear this beautiful colour. so my dresses were an eyecatcher twice. twice i have worn a floor-length dress. at the end of the 10th grade it was a close-fitting one, embellished with beautiful 3D flowers at the neckline. at my A level prom night i wore a widely flared dress with a corsage, over and over embellished with sparkling gemstones. i added a golden clutch, long and white satin gloves and sparkling jewellery. today i want to show you my A level prom night dress, and other beautiful dresses i have found online for you with which you would also stand a good chance of being the star of your very own prom night. which ones would be your favourites? They're a lot of offers now in to many sites, wanna see yours! I love the second last one, that purple colour is so gorgeous!! Hübsche Kleider dabei, aber irgendwie keines für mich, die ich zu so einer Feier tragen wollte. Vielleicht das erste schwarze Kleid. Der Rock von einem Hochzeitskleid sieht übrigens so aus wie von der rechts Aussen auf eurem Gruppenfoto. ich werde wohl "Rubbel die Katz" heute sehen. Die anderen sind auch wunderschön, am besten gefallen mir das Schwarze mit dem silbernen Kragen und das Weiße am Ende! Auch wenn ich nicht alles von Dir sehen kann, warst Du offenbar schon damals eine Schönheit und rot hat schon immer phantastisch an Dir ausgesehen! Ich finde Dein Kleid absolut toll und nicht nur deswegen weil es rot ist. Auch der Schnitt gefällt mir so richtig gut. Hoffentlich ist doch noch mit einer der Wohnungen alles klar gegangen. Ich habe an Dich gedacht und Dir die Daumen gedrückt! Super schöne Auswahl. Das weiße ist ein Traum. It’s simply stunning dresses. those are all beautiful. Gorgeous! Black dress is my favorite! There are some great colors and selection of dresses here!